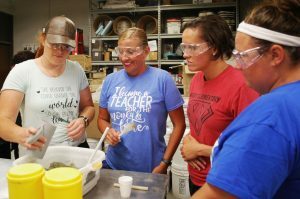 Iowa State University (ISU) is offering elementary school teachers the opportunity to participate in a one-week professional development workshop to become more acquainted with transportation and civil engineering. Iowa State University is hosting the workshop, which will be presented by leading faculty, graduate students, Department of Transportation engineers, science/math specialists Lynne Bleeker and Debbie Haywood. The focus of the course is deepening teachers’ content knowledge, skills, and confidence to enable them to teach the Engineering dimension of the Next Generation Science Standards. A small kit of hands-on materials will be provided to enable teachers to teach engineering, math, and science concepts appropriate for the elementary classroom.